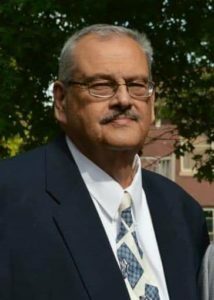 Larry Thomas Lichtenwalter, 71, of Lincoln, passed away March 29, 2019 at home surrounded by his loving family. Visitation will be Tuesday, April 2, 2019 from 5-7 PM at Holland Barry & Bennett Funeral Home with a Rosary service at 5 pm. Funeral Mass will be Wednesday, April 3, 2019 at 10 AM at Holy Family Catholic Church. Burial to follow in St. Mary’s Cemetery. Larry was born March 16, 1948 in Lincoln, IL., the son of Charles and Mary Elizabeth (Clevenger) Lichtenwalter. He married Deborah Winter in 1974. He retired from the State of Illinois, working maintenance at the Attorney General’s Office. Larry was also formerly employed at Logan Correctional. He was precinct committeeman for Logan County Democrats, East Lincoln 9. He enjoyed scratch off lottery tickets and coin collecting. Surviving are his wife Deborah Lichtenwalter; daughter Laura (Michael) Groh, son Todd (Jennifer) Lichtenwalter, son Phillip (Scott) Lichtenwalter; 8 grandchildren; brother Ronald (Myrna) Lichtenwalter and sister Joyce Lichtenwalter. He was preceded in death by his parents, infant brother Richard and sister Ellen Moore. Memorial donations may be made to the American Cancer Society and will be accepted at the funeral home.